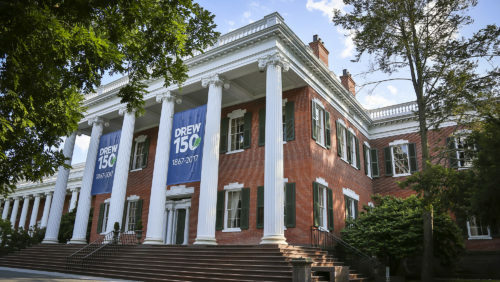 Drew University, a Phi Beta Kappa liberal arts university, includes the College of Liberal Arts, the Drew Theological School and the Caspersen School of Graduate Studies. Drew is located on a beautiful, wooded, 186-acre campus in Madison, New Jersey, a thriving small town close to New York City. It has a total enrollment of more than 2,000 students and has 148 full-time faculty members, 99% of whom hold the terminal degree in their field. The Theological and Caspersen schools offer MA and PhD degrees and the College confers BA and BS degrees in more than 30 disciplines. Drew’s new, one-of-a-kind, leading edge path to an undergraduate degree, Launch, syncs career development with rigorous academics and powerful community and will roll out in fall 2019. Particularly noteworthy opportunities for undergraduates include the Charles A. Dana Research Institute for Scientists Emeriti (RISE), home of 2015 Nobel Prize Winner for Medicine and Drew Fellow William Campbell, the Drew Summer Science Institute (DSSI), the Center for Civic Engagement, as well as New York City semesters focusing on Wall Street, the United Nations, Contemporary Art, Theatre, Social Entrepreneurship and Communications and Media in New York City and several international semester programs.